A maskless CPAP is one of many options. People who suffer from sleep apnea may be happy to learn that there is now an alternative to wearing an oxygen mask at night called a maskless CPAP. A CPAP (Continuous Positive Airway Pressure) machine is used by patients that have sleep apnea. Sleep apnea is caused by the airway closing while a person sleeps, cutting off breathing. CPAPs provide a continuous supply of air pressure to the airway to keep it open. A sleep physician prescribes the specific amount of air pressure used on the airway. Full-face CPAP masks create a seal around the mouth and nose to deliver a steady amount of air pressure. Maskless CPAPs achieve the same goal, but they do not cover the face. There are three types of maskless CPAPs: nasal pillow, nasal prong and an oral mask. All three types of apparatuses have tubing that goes into each of the nostrils, much like a nasal cannula for standard oxygen patients. The tubes on a maskless CPAP are much larger, though. Each one is large enough to create a seal around the nostrils to stop air from escaping. Since the tubes fit tightly into the nostrils, no headgear is required to keep the apparatus attached. 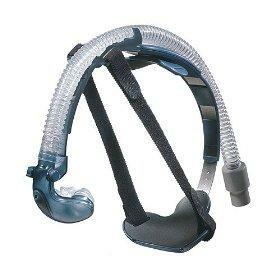 Many patients can benefit from the use of a maskless CPAP, such as the NoMask device. Those who find a mask confining or uncomfortable may instantly find this type of apparatus liberating. Gary Freed, D.O., FAAP, FACOP, Director, Pediatric Sleep Laboratory-Children's Healthcare of Atlanta at Egleston, says that he would suggest this apparatus to patients that have beards, mustaches, skin disorders such as rosacea or severe acne. There are many things to consider before switching from a full-face CPAP to a maskless one. Overcoming fit challenges: "For a CPAP to be effective there needs to be a very tight fit and this can cause irritation to the face or bridge of the nose," says Freed. The mask should be snug enough to prevent air from escaping but it should not be uncomfortable. Patients having trouble finding the right fit may want to consider maskless options. Comfort concerns: Freed also notes that with a maskless device, the air pressure is administered directly into the nostrils, which can be very uncomfortable to the patient. "The pressure of forcing air directly into a child's nostrils can cause dying of the mucous membranes leading to bleeding," says Freed. Cosmetic considerations: The tubing on maskless devices can lead to distortion of the nostrils causing them to look enlarged, uneven or disfigured if the maskless option is used for long periods. The patient's doctor, and possibly their dentist, should be consulted when making a change in treatment, as well. All CPAP devices should only be used under a doctor's advice according to Craig Schwimmer, MD, MPH, FACS, a board certified otolaryngologist. "In addition, some of the Maskless CPAP devices use a "boil and bite" oral appliance," says Schwimmer, "which many dentists consider problematic due to the possible periodontal irritation they can cause." The use of any CPAP is not something that should be taken lightly or used temporarily Schwimmer also stresses. "A CPAP machine that is sitting in the closet or sold on Ebay does a patient no good (yes, there are internet auction sites devoted solely to unwanted CPAP machines! ), says Schwimmer. "Because most patients do not regularly wear their CPAP devices, their doctors have to ask about it. One of the biggest mistakes we (doctors) make is simply prescribing CPAP and assuming that the patient's problem is solved. If the patient doesn't use it, it is of no benefit. So when patients refuse CPAP, they need to be offered alternatives that they can tolerate." When used on the right patient under the supervision of a trained physician, a maskless CPAP can be a great alternative to traditional forms of sleep apnea treatment.